The Combo pattern combines both the Driving and Flood optics. It shines light downrange in a focused, rectangular 20Wx8H degree pattern while also illuminating area around it in a full 80Wx50H degree spread. 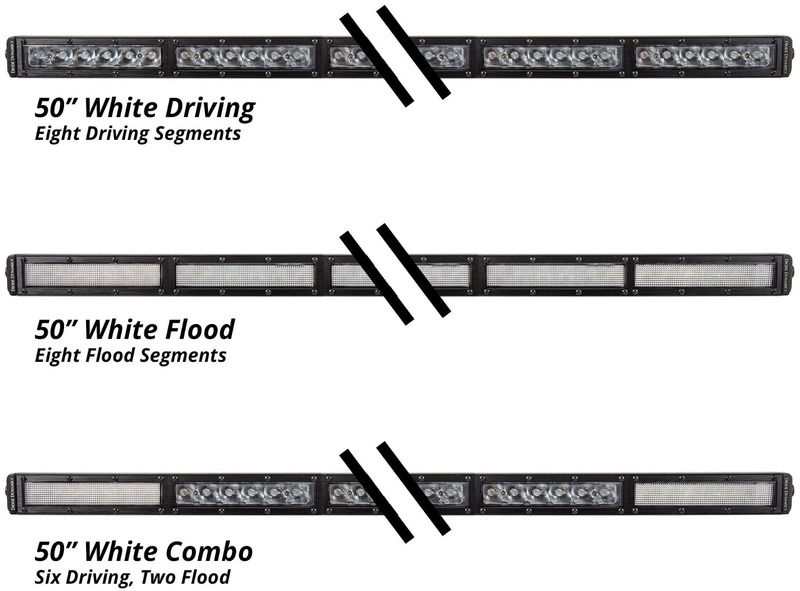 The Stage Series 50" Combo Light Bar features six driving lenses in the middle with two flood lenses on the outer edges. White or Amber. All Stage Series light bars are available in a cool white or amber color. The white is a 6000K color temperature, which is a true white output, without any blue. The amber is a brilliant deep yellow color, perfect for hazards or high contrast in poor weather. The SS50 Stage Series 50" Amber Light Bar can be found here. Does this include brackets for a 2018 Jeep Wrangler JL? We currenlty do not have a 50" bracket setup for the JL, as our current mounts for the JL can be found here!